Today I am deviating from my normal Decorating Posts and answering a question I received from a reader about my exercise routine. Some of you may have seen pictures of our home gym and my comment about loving this little weight bench and that my use of it has given me better results than anything else I have tried. I really am a believer in weight lifting. It all started when I was just out of college and teaching High School. One of the other teachers invited me to work out with her in the school gym so I did. When she started using the machines and lifting weights I was blown away by how much she could lift and how strong she was- and she was probably 20 years older than me! I wasn't about to let an older lady beat me! So I started using the machines and lifting weights as well. I couldn't believe how quickly the fat started melting away. Fast forward to a few years later after my first child was born, I wanted to start working out again so I joined a gym. It was a small Ladies gym with only a couple machines and some really fun classes- so instead of using the machines I did the classes. I was there doing a class EVERY DAY mon -fri. and did this for about a year and saw almost no results. Talk about frustrating. I'm sure I had improved my heart health and stamina but I wanted to lose inches! So I stopped going and that is when my husband bought our little home gym from Walmart. 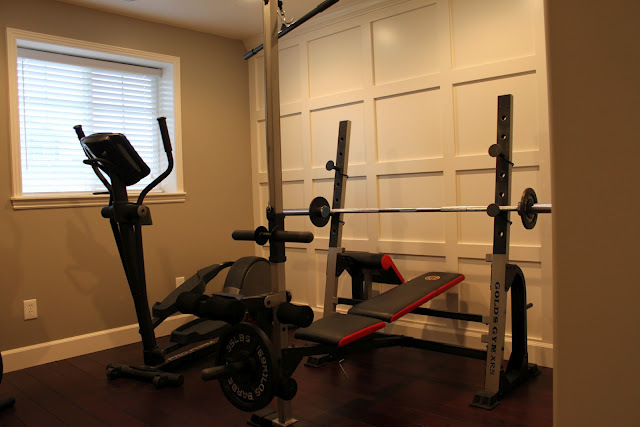 It was inexpensive and basic as far as home gyms go - but it works for us. I checked out Walmart's site and this bench is similar to ours and is $275. FYI: You have to buy the Plate weights separately. Click here for the link. Because of my pregnancies (and other reasons) there have been a lot of stops and starts in my life in regards to working out - but every time I have done weight lifting I have seen great results. I still include a little cardio in my workouts but the majority of what I do is focused on building lean muscle. I remember watching a morning show where they had the author of this book (click here for link) and he talked about how women should work out like a man does. Men don't go to classes or even spend a lot of time on tread mills, they are always on the machines or lifting weights. And those guys are in good shape - right! Women are never on the machines or lifting heavy weights - they stick to the aerobics. Doing only aerobics, or any kind of cardio, may work for some women - it just didn't work for me. I know the fear for a lot of women is that they don't want to bulk up like a man - but that is impossible, our muscles are different than a man's. For me personally it has just made me more tone and taken inches and fat off. "Lifting weights is an essential exercise. Aerobic training is fine, but if you compare the amount of effort, it’s simply far easier to lose weight through lifting some weights than it is doing hours and hours of aerobic exercise. Another great article I found is this one. So wether you go to a gym or get a system at home just concentrate more on the weights. I work out 4 days a week for an hour. Even when I am on vacation - I do not miss a day of exercise. Sometimes the entire hour is spent on weights, sometimes I will do the treadmill or eliptical for 20 min. and weights the rest, sometimes I will just do weights on my lower body the whole time or upper body the whole time, sometimes I won't do weights and just do toning the whole time like squats, lunges, push-ups, leg lifts, etc. The important thing is to try to always be changing things up so that your body doesn't get used to a routine. When you begin you won't be able to lift a lot of weight - but push yourself to see just how much you can do and over time increase your weight. Basically you want it to be so hard that you can barely do about 15 to 20 repetitions. I know the other thing holding women back is not knowing how to use the machines - don't be afraid to ask for help at a gym. Once you have used just a few machines you will understand how most all of them work, honestly it won't take you long to learn this. When our home was being built, our home gym was packed away so I had to join a gym. I found that "Anytime Fitness" was the best gym for me - it was cheaper than most gyms because they didn't offer classes or have instructors, just a bunch of weight machines for me to use. From my little home gym I am able to do 2 leg workouts (one for the quads and one for hamstrings), and 4 arm work outs, bench press, shoulder press, tricep press, and a Lat pull-down. I also use a couple of 10 or 15 pound free weights to do a few different exercises for my arms. It generally takes me an hour to do each of these weight exercises 2 times. I like having a gym at home because there really is no excuse for me not to work out. Personally I like to workout in the evenings when my kids are in bed. That way I have no distractions and I often enjoy listening to a good book on my ipod or watching something on tv while I work out- so it is a good way for me to get in some "me time." By the way I also like the fact that I then shower at night when I am done with my workout and when I wake up in the morning a shower is one less thing I have to do - I can just get dressed and go! So that is my workout routine. Obviously the best way to loose weight is not only to work out, but also watching your diet as well. For me sugar and sweets have never been a real temptation - but I love food, and portion control was my problem. Instead of doing something drastic to my diet (which I knew I would probably hate and not stick with) I basically just started eating half of what I used to. DON'T do this if you are already eating small amounts, I don't want to encourage anorexia- like I said I had a problem with portion control and was eating WAY too much. For example at restaurants, servings are almost always very large and I always finished my entire plate. I was often sick to my stomach I was so full. Now if I go out to eat, I eat half my plate and save the other half to take home for another day (a win/win). For breakfast I started only eating one waffle or pancake instead of two or more, and lunch is no longer a whole sandwich and chips. I either do a half sandwich with chips or a whole sandwich and no chips. Just making those simple changes along with my workouts allowed me to drop 4 pant sizes. Everybody is different though and ought to find out how many calories they are eating a day and how best to keep their calories in a healthy range each day. To quote the Biggest Looser "it's all about Calories in vs. Calories out." As you may know I recently had a baby 2 months ago. Because weight lifting is not too strenuous I was able to continue my workouts until I was about 6 months along, at that point I was too awkward to move! By the way that is the longest I have ever worked out during a pregnancy. I know that made my postpartum recovery the best it has ever been - you would think that since it was my 4th child and I am over 30 it would be my worst. Not so. As of last week I decided it was time to start working out again. My muscles are on fire- but it feels good! I am currently wearing all my pants that I kept from when I was my heaviest and I would like to get back down to my smallest pair of jeans again. I gained 40lbs. during my pregnancy and have 15 lbs left to loose. I will let you all know just how long it takes me to get there! I have faith that this weight lifting thing is going to work again! Good for you! I'm a big believer in weight training myself, and it's always fun to be lifting on the "guys side" of the gym. Thanks for clearing this up! Wow! Thank you so much for sharing this with us! I have always shied away from weights for all the reasons you listed - but you have completely inspired me to try this approach. Also love your so-simple approach to calories - I am never successful with cutting things out altoghether - I'm all over your idea of eating what you normally would, just less of it. Thank you again - I'm inspired! Thank you for sharing. I have learned a lot! Thanks for your motivating post! This is great timing, my husband and I just joined a gym and I want to focus on weight training. I have the book "The New Rules of Lifting for Women" by Lou Schuler, which I'm going to use as a guide at the gym. The author could have been who you saw on TV. For me I love to eat and run, but my weight just maintains and I've been wanting to lose 10-15 lbs forever. I have high hopes that this will work for me, as long as I watch my portions too :). Thanks again for sharing!